The EGO 15" String Trimmer Attachment, Edger Attachment, Power Head , 5.0Ah ARC Lithium™ battery and 56 Volt Charger Combo Kit is a fantastic EGO starter kit. The 15" String Trimmer and Edger combo is compatible with the EGO POWER+ Multi-Head System, making it convenient and efficient to get all your lawn trimming and edging needs accomplished. The EGO 15" String Trimmer Attachment, Edger Attachment, Power Head , 5.0Ah ARC Lithium™ battery and 56 Volt Charger Combo Kit is a fantastic EGO starter kit. 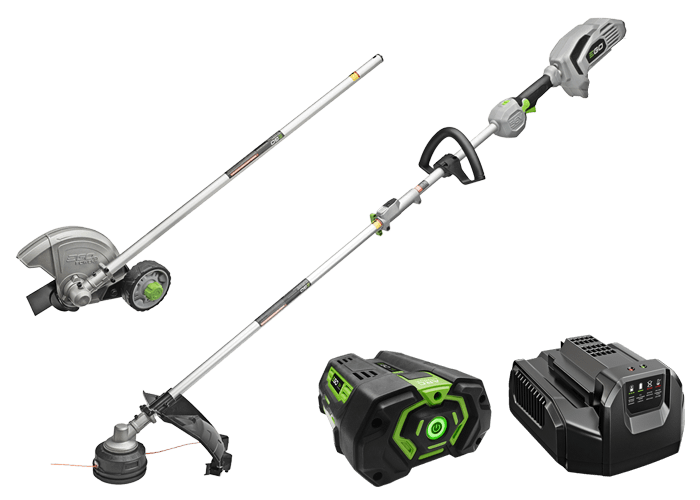 The 15" String Trimmer and Edger combo is compatible with the EGO POWER+ Multi-Head System, making it convenient and efficient to get all your lawn trimming and edging needs accomplished. The 15" String Trimmer attachment is equipped with the EGO Rapid Reload head, rewind your line faster and easier, to help get the job done. The 15" cutting swath, bump-head line advancement and professional-grade 0.095" cutting line deliver professional grade results. The EGO 8" Edger attachment has quick and easy depth adjustment to make edging around your sidewalks and driveway easy. Compatible with all EGO ARC Lithium™ batteries to maximize the convenience of cordless and deliver Power Beyond Belief™. Edger attachment adjustable from 2-1/2" to 4"
The 10" EGO Pole Saw is part of the EGO POWER+ Multi-Head system. Built tough for efficient cutting limbing. The automatic lubrication system lets you work until the job is done. …Very pleased. Switching attachments is a breeze…the 5 Ah battery tears through whatever I put it on.